You are here: Home / All Freebies / Building Thanksgiving Sentences – Turkey Talk! 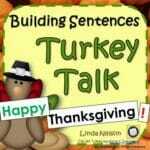 Building Thanksgiving Sentences – Turkey Talk! With Halloween behind us, it’s full steam ahead into the busy month of November! Here’s a pocket chart center that will strengthen your students’ vocabulary, sight word reading, and sentence building skills. Your students will use 19 word cards and 3 punctuation cards to build sentences about Thanksgiving at the pocket chart. 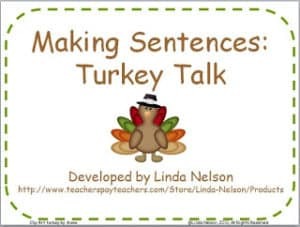 “Turkey Talk” also includes 13 sentences to model and a recording sheet for your students to write and illustrate their favorite sentence. Just for fun, there are even three turkey pointers to reinforce one-to-one match! 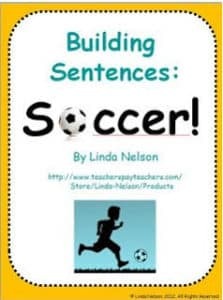 Score BIG with Soccer Sentences!